At a glance, you may see no reason to doubt the data — it certainly appears to be a viable scientific prediction. But what about that handle, @weatherwarsinfo? Sounds kind of suspicious. So you Google the name “Scott Stevens,” plus “meteorologist,” and you find that he believes so-called chemtrails are used to control weather patterns. You learn that he resigned as the meteorologist of a local TV station in 1995 after it came out that he had lied about his credentials. More astonishingly, Stevens left a different TV station in 2005, after working there for nine years, so that he could pursue an unusual theory about Hurricane Katrina: He claimed that Japan’s Yakuza mafia had acquired an electromagnetic generator made in Russia at the height of the Cold War and used it to create the storm to “avenge” the victims of the atomic bomb dropped on Hiroshima. And in 2012, he told conspiracist Alex Jones that Hurricane Sandy’s path had been set by the government, which possesses means of weather modification beyond all reckoning. And what of the methods? Artificial weather-chasers are typically even less specific there, except to say that the military-industrial complex has been experimenting with ways to start or prevent storms for many decades, so of course they figured it out. 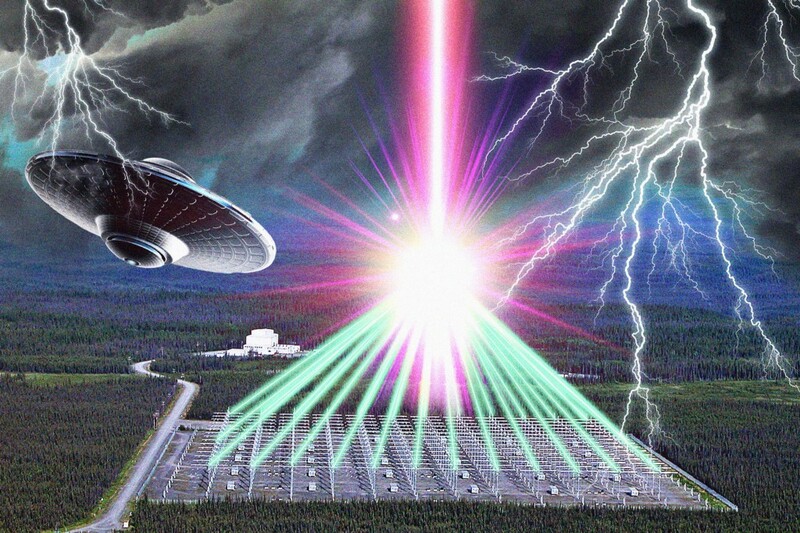 If there’s one device or installation the conspiracy theorists have zeroed in on, it’s the High Frequency Active Auroral Research Program (HAARP), based in Gakona, Alaska. The facility was established in the early 1990s by the Navy, Air Force, the Defense Advanced Research Projects Agency (DARPA) and the University of Alaska Fairbanks. Its antennae were used to research ionospheric phenomena in the hopes of developing enhanced technology “for communications and surveillance purposes,” per the program’s description. This combination of widely misunderstood science, a remote location and government interests — it is, after all, “a gigantic, high-energy, Pentagon-funded gizmo” — has led people to believe that HAARP is a mind-control operation, a means of assassination and the culprit behind everything from the TWA Flight 800 crash to the Columbine shooting. And despite having been shut down several years ago, it continues to take the blame for recent waves of “weaponized” weather. The machine most emblematic of our inability to harness or repel climate events, however, would be the hail cannon, “a shock wave generator used to disrupt the formation of hailstones in their growing phase.” Although the concept supposedly dates back to before the Industrial Revolution, there’s no reason to suspect hail cannons actually work — in reality, they’re more of a loud annoyance, producing intense booming noises every few seconds when a storm is detected. Would a civilization that can create or guide massive hurricanes still be using something this silly and superstitious? Truthers, of course, will insist that the last few generations of progress in weather control have been kept secret. Their strange conviction as to our species’ technological omnipotence harks back to ancient rituals meant to please the gods of the sun and surf, guaranteeing favorable seasons. No doubt it is more comforting to think that some undefined “they,” no matter how evil, is in control of the elements than to confront our basic helplessness — just as President Trump would rather dismiss climate change as an elaborate Chinese hoax than deal with the stark threats it poses to the planet. In that light, the weather-control conspiracists represent a perverse new iteration of climate-change skepticism, which otherwise tends to hold that human impact on nature is grossly overstated. While many of us worry about whether Harvey, Irma, droughts and heatwaves are partly “human-made” catastrophes, worsened by melting glaciers and rising oceans, the weather truthers are at once ignoring that possibility and heightening it to a fabulist extreme: Not only are the hurricanes and wildfires human-made, but we made them on purpose, to serve a shadowy elite. The same global trends that up the frequency of “hundred-year” floods will simply reinforce this narrative, offering countless more examples of brazenly “engineered” storms. In other words, as forecasts call for more wild weather, we can expect a lot more crazy.